To the West of the A683 and about a mile North West of Kirkby Lonsdale, Kirfitt Hall sits next to the River Lune. 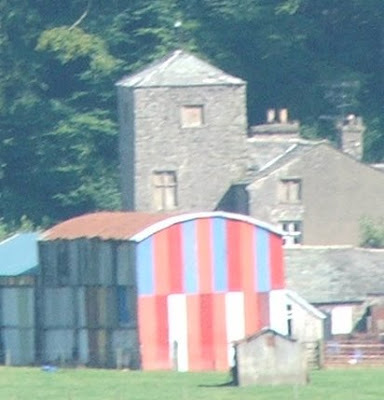 Clearly visible from Ruskins Brow behind the church in Kirkby Lonsdale, the rectangular tower can be seen towering over the later farm buildings. Above. An old postcard just about shows the tower behind the hall on the left hand side. The collection of buildings at the farm are generally thought to date from the early 17th century, although some commentators think that the tower contains parts of an earlier pele tower, and all were certainly built on the remains of an earlier hall. Kirfitt (sometimes called Kerfitt, sometimes Kirfit) has romantic connections with Henry VIII. Legend has it that the king visited and stayed the night at the hall when he was courting Katherine Parr. Apparently the headless apparition of Anne Boleyn made an appearance that night, disturbing the King's sleep. 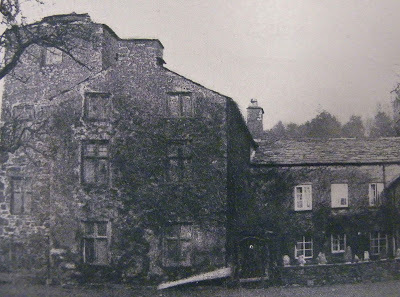 The rumours of the King staying here are probably groundless, as it's highly unlikely that Katherine Parr spent much time in Kendal.....the Parr family spent much more time in London at this time. The tower is now nearly derelict, whilst the late 17th and early 18th century farm house and out buildings are in good condition. The tower is four storeys high, with a staircase tower adjoining. To the North of the tower in the fields, feint earthworks can be seen, perhaps the remains of protective ditches and banks, although it's more than likely that these are flood marks...the river floods frequently at this part of its course. The farm is at the end of a private drive, and the tower can only be viewed from a distance from Ruskins Brow in Kirkby Lonsdale. 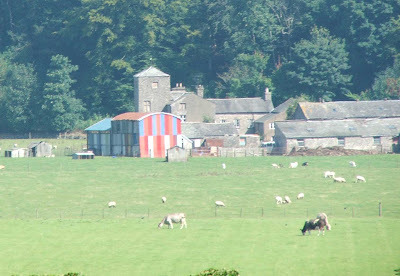 It is the distinct tower rising from behind the multi coloured barn in the foreground. Hi, I found this article very interesting. My Grt-grt-Grandfather, George GARNETT was born there circa 1833. Both he and his father William GARNETT were listed on George's marriage cert. as being farmers at Kirfitt Hall.